Here’s a resort that’s different – a playground of wide-open slopes about 30 minutes from the fabulous Alhambra in historic Granada, in Southern Spain, and just over an hour from the Mediterranean’s finest beaches. 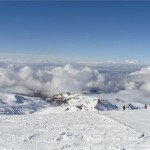 The Sierra Nevada ski station, high on the slopes of Veleta, Spain’s third highest peak, is Europe’s most southerly resort. 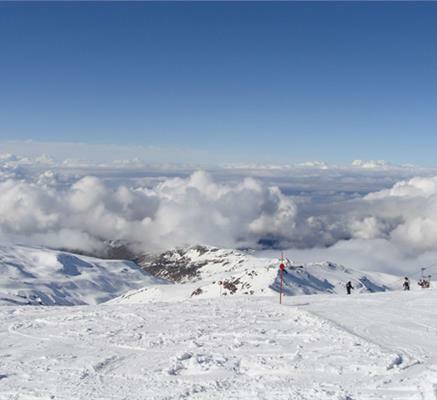 Though small by the standards of European mega-resorts, the peak altitude of 3,300m stands comparison with almost any Alpine attraction, as you can see the Med and Africa from there. As does an impressive 1,200m descent to 2,100m. So Sierra Nevada punches far above its size and weight – a serious, high-altitude destination, with world class facilities that regularly hosts top-flight skiing competitions, such as the World Championships and World Cup. 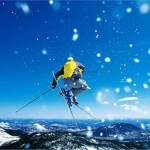 And in March 2013, the FIS Freestyle Ski and Snowboard World Cup super-final. 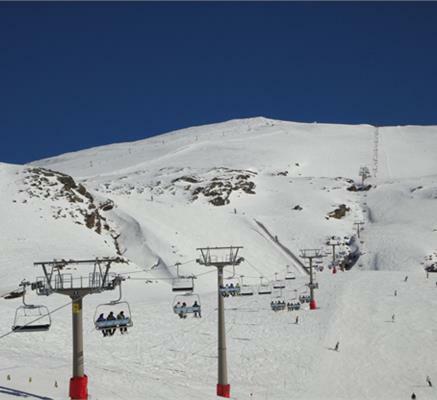 Besides the on-piste action, Sierra Nevada now has the largest permanent half pipe in Spain, 165m long and six metres high, and recent expansion of the Mirlo Blanco recreation zone has included an ice rink, tobogganing, ski-biking, mini-skis and a track for wheeled toboggans. 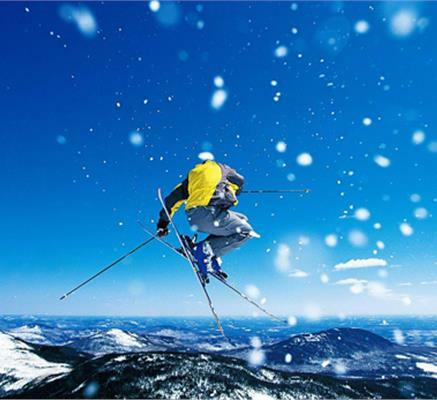 Activities off the slopes focus on the trendy modern resort village of Pradollano, at the foot of the resort, where the two main cable car stations are also sited. Pradollano is large enough to provide everything that makes for a perfect ski holiday. In Spain’s current period of austerity, Sierra Nevada is unlikely to take a backward step. It remains a place of patriotic pilgrimage, led by regular visitor Prince Felipe. So Spain’s wealthy adore the place, too – its film stars, sports icons like the Beckhams and bullfighters, and business titans will remain loyal, The British make up about six per cent of overseas visitors. Sierra Nevada’s hotels and apartments cover the full economy-to-luxury spectrum. And its attractions are now nearer, a planned twice-weekly Hispania Airways Gatwick-Granada service, from early December 2012 has recently been cancelled, in addition to Malaga, the established arrival point, only a two-hour transfer away. No problem for ski drivers – there’s a vast underground car park – Spain’s largest, taking 2,600 vehicles. 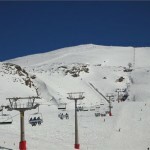 High altitude and northerly orientation gives Sierra Nevada the best snow and longest season in Spain, stretching five months from late November into April, while its latitude ensures that mid and late-season skiing is a sun-kissed pleasure with many people happy to tear down the slopes in little more than beach wear, no wonder as it’s probably the sunniest in Europe, with an average of 85% during the season (92% last season). 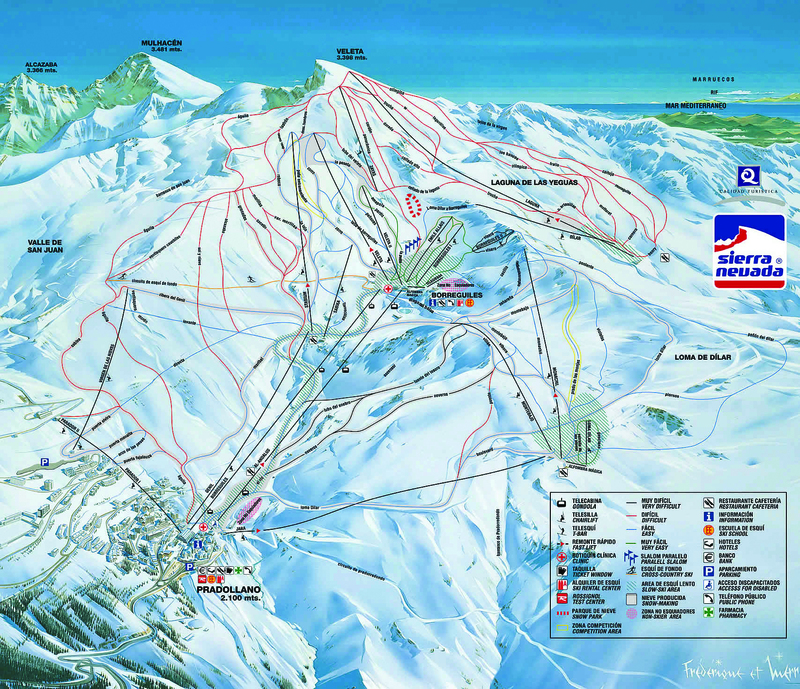 There’s 100 km of runs on 45 pistes, almost all above the tree line. They provide a wide range of challenges and the more expert skier can explore six off-piste routes. So Sierra Nevada means ski fun with minimum hassle, especially before mid-day as many bars buzz all night. Outside weekends and public holidays, it’s a resort collector’s dream. With skiing taking place over a vast area, supplemented by snow cannon, and lift queues minimal, it’s a smart choice, particularly for novices aiming to cement intermediate status and intermediates out to add pace and develop skills. It also means boarders have ample space to polish their technique and tricks. There are two cable cars, 15 chair lifts and a ski lift open daily from 9am to 5pm, plus night skiing along the El Rio slope, a 3km/545m vertical drop.